What a rush! One of the tallest freefall tower rides in the world, Sky Screamer delivers some wild thrills. Perched atop a 150-foot hill, the ride offers some spectacular views of Niagara Falls as well. Wild height and intense G-forces make this one thrilling ride. Freefall tower type: Compressed air-launched. It is a double-shot ride that both launches from its base and drops from its top. Just getting to Sky Screamer is a bit of a challenge and helps build the anticipation. It sits in the middle of the park atop a 150-foot hill. (Non-riders may want to make the trek just for the view of Niagara Falls at the tower's base.) The ride has three towers, which can theoretically accommodate a lot of passengers, but Marineland often runs only one or two of the towers at any one time. Riders pull the over-the-shoulder harnesses down and latch them into the buckles. After the ride operators check to make sure everybody is secure, they activate the ride. The ring of seats slowly rises, providing a bit of a nerve-rattling false start, as the compressed air builds in the tower. The seats then lower slightly and pause for what seems like an eternity as passengers' hearts race and palms sweat. The ride then blasts off like a bullet and soars to a nosebleed 300-foot height. That's at least 100 feet taller than most tower rides, and the difference is striking. As riders (at least the fear-filled ones) hang on for dear life, the intense free-floating negative G-forces are both exhilarating and terrifying. The ride then drops and rises a couple of times to deliver some more G-force jolts before it slowly rises to the very top of the tower—and hangs there for what seems like an eternity and a half. At 300 feet in the air (plus another 150 feet for the hill upon which Sky Screamer sits), the view of Niagara Falls is breathtaking. Anticipating the ensuing drop, and attached to an open seat, with legs and arms dangling, however, it's difficult to appreciate the view. Without warning, the ride drops nearly 300 feet, then bounces a few times up and down the tower before mercifully returning to the base. Riders emerge, wobbly kneed, to make the long trek down the hill. 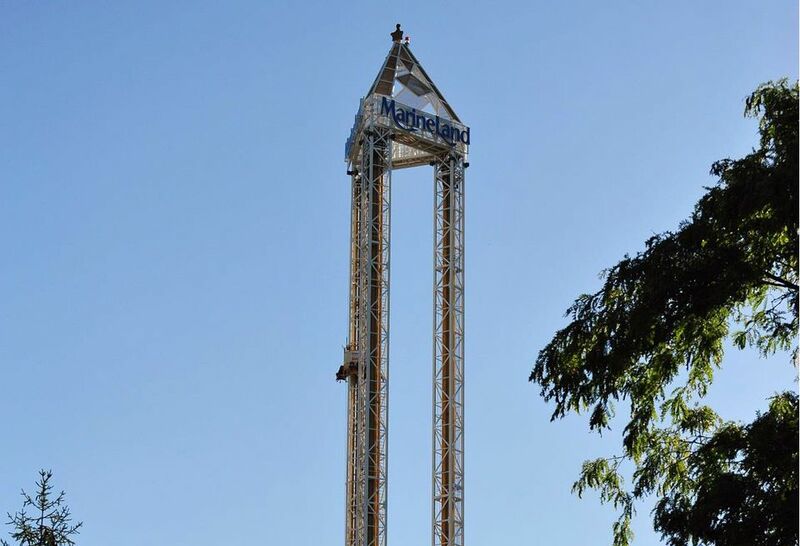 In typical theme park fashion, Marineland tries to wring bragging rights out of Sky Screamer by billing it as "the world's highest triple tower ride." While Sky Screamer is undeniably tall and incredibly thrilling, the 456-foot Zumanjaro: Drop of Doom at Six Flags Great Adventure in New Jersey and the 415-foot Lex Luthor: Drop of Doom at Six Flags Magic Mountain hold the records for the world's tallest freefall rides. They only have one tower, however, so I guess Sky Screamer's “triple tower” distinction allows Marineland to stake the claim. Also, unlike similar drop tower rides, Marineland’s Sky Screamer has a tall cap atop its tower that extends its height to 450 feet. That makes the tower structure an imposing 450 feet tall, but the actual ride climbs and drops 300 feet. Sure, the Niagara Falls ride sits on a 150-foot hill, but the Stratosphere Tower's Big Shot is still the reigning king of tower rides. The Las Vegas ride rises a relatively puny 160 feet from the base to its tip. But—and it’s a big but—the base sits on top of the 900-foot Stratosphere tower. By anybody's math, that's over 1000 feet in the air. Think You're a Big Shot? Prove it on Las Vegas Thrill Ride.